ST. FRANCIS, S.D. 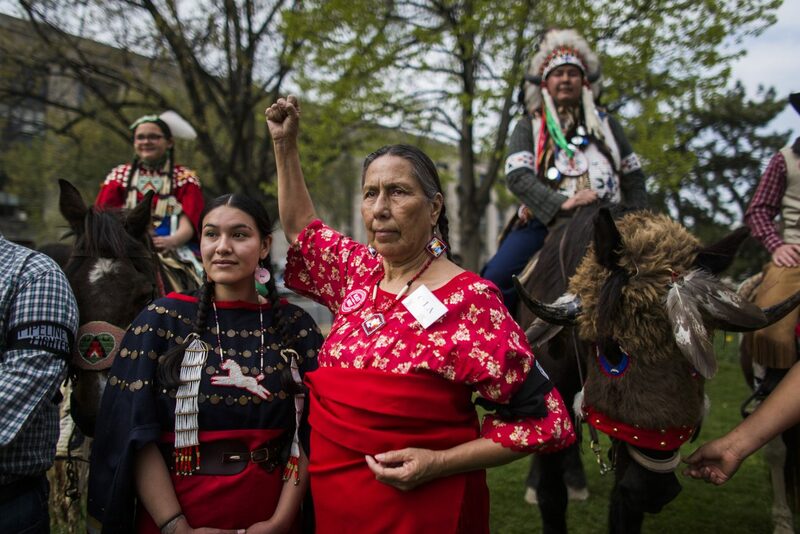 (CNS) — The Jesuits are returning more than 500 acres in South Dakota to the Rosebud Sioux. The formal return of the property is expected to be complete sometime in May. So the church accepted land from the United States back in the 19th century. Never mind that the land didn’t belong to the United States. The church then kept it for over a century. Now, having decided they don’t want it any more, they’re giving it back to the rightful owners, over 100 years too late. And this is praiseworhy? Mighty damn low bar! A low bar is better than the stonewall that has existed for the better part of that 100 years. Let us hope that this move spurs more returns of the land. Let us pray it will lead to the Holy Father formally abolishing the Doctrine of Discovery, that centuries-old policy that hangs over the heads of Indigenous People worldwide. Amen!! Encouraging news and an important step in moving the Catholic Church forward. Returning the land to the Rosebud Sioux people is the RIGHT and just thing to do. Thank you for setting this precedent. It means a lot to many of us who are not Native to see this is being done in the name of righting wrongs. This is amazing and certainly sets the example for all of our United States. It is high time the land is being returned to rightful owners! As a person brought up in the Roman Catholic faith I found this gesture encouraging, especially by the Jesuit order. Wish that Obama had been more of a man to go up against big oil and given the Teapot Dome fields back instead if selling it to the oil interests doing what Albert Fall was sorta caught trying to sell off in the days of Warren Harding. When does the church plan to return all you stole from Africa? To Rugeirn and “Peace Warden”, These are your sorry responses to something positive, that is trying to heal? What have either of you done in the past week that has donated something other than your unfortunate attitudes. “Peace Warden” (that’s an oxymoron, right) what in the heck are you even talking about? Thank you for returning the land to the tribe. May God bless you. As it should be. Finally honoring the treaties made with American Indians, the first citizens of this land. This is good. All too much land to be given back from the original Doctrine of Discovery, manifest destiny theft and genocide. And clearly Compton still has a colonial conception of the value of land. This is a good move amongst what must be more good moves…all the land must be returned to the indigenous peoples and nations. That is the right thing to do. The catholic church has a long way to go in this effort. And please repeal and rescind and repair the racist, genocidal papal bulls of the 1400’s that caused this travesty of justice against indigenous peoples of Turtle Island and African peoples. Good! Finally! The Congregationalists didn’t, now the Catholics, which denomination is next? Did you mean to say that the Congregationalists​ “did it” instead of “didn’t”, Rev. ?